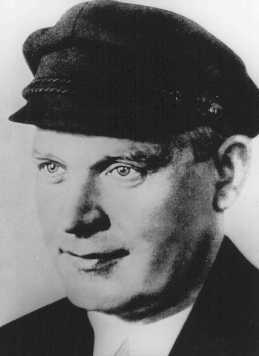 On this date in 1944, German Communist Ernst Thälmann was shot at the Buchenwald concentration camp. A true proletarian turned proletarian leader (and reliable adherent to Moscow’s line), Thalmann stood for election to the German presidency no the Communist Party ticket against Hindenburg and Hitler in 1932 (he’d also run in 1925). The Gestapo nabbed Thalmann in its sweep for leftists following the Reichstag Fire. Eleven years he waited in prison — being tortured, naturally — for his turn on the stage of a show trial. Or any trial at all. Instead, the Weimar Communist leader languished in detention as the horror of Naziism swallowed Germany, with nothing to give the anti-fascist cause but his name — here adopted by a Spanish Civil War battalion. We have such cinematic treatment of the man because after the war, the legitimately proletarian, demonstrably antifascist, ideologically unsullied, and conveniently dead Thalmann made ideal material for the Communist East German state’s national pantheon. The myth employed all of the media available to a modern industrialized state. In addition to the scholarship produced by professional historians, popular works with a similar agenda also appeared. Irma, the slain party leader’s daughter, wrote a biography of her father intended for children. Max Zimmering wrote one of several children’s novels about Thalmann, and East German poets lionized the martyred communist leader. … Thalmann memorials were built, and membership in the SED’s youth organization, the Free German Youth (FDJ), began with the Thalmann Pioneers. Finally, Thalmann’s life was the topic of several films and television movies, the most important being the two features, Ernst Thalmann – Sohn seiner Klasse (Ernst Thalmann – Son of His Class, 1954) and Ernst Thalmann – Fuhrer seiner Klasse (Ernst Thalmann – Leader of His Class, 1955). And something else, too: a barely-there Caribbean island ceremonially gifted to East Germany by Cuba in 1972. Is it the last outpost of the German Democratic Republic? * Yes, this is glib; Hindenburg, not Hitler, won the 1932 election. However, the Nazis’ plurality victory in that year’s Reichstag election also gave Hitler the juice to demand the Chancellorship and set himself up to wield total power in Germany. Whatever the ballot boxes on any particular day had to say, Hitler obviously won the early 1930’s.